Looking for something to put on all those toast points you bought for the company you're having over? This is the answer! 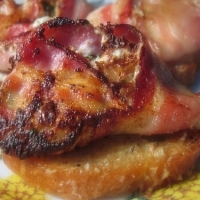 Who doesn't love the combination of bacon (pancetta, in this case), cheese and bread? It will be a crowd pleaser. In a large skillet over medium low heat, add the butter and the onion. Salt the onions liberally. Let cook for 30 min or until the onions are a golden color. 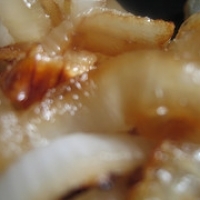 Once they turn golden, remove the onions from heat and let cool briefly. Dice them until smaller pieces. While the onions are cooking, you can make the crostini. Set your broiler to high. Slice the baguette into 1/2 inch slices. Lay them out on a cookie sheet and light drizzle with olive oil. Salt, pepper and grate on the cheese. 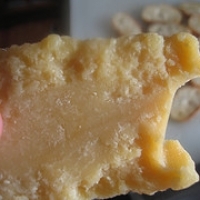 Run under your broiler for about two minutes or until the cheese is melted and the bread is golden brown. In the alternative, if you have a toaster oven you can toast them in batches. It’s time to make the filling. In a bowl, mix together the ricotta, caramelized onion, and basil. It’s important to taste. You will want to season the filling with salt and pepper, but you don’t want to oversalt. The key is to remember it’s going to be wrapped in pancetta, which has a nice salty flavor; oversalting will be like doubling the saltiness of each bite. Set out your pancetta. 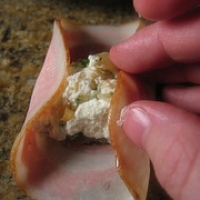 Place about a tablespoon of filling in the center of each slice. Fold up two sides until they are about a quarter of the way in. Roll the remaining portion careful to keep the ends inside the roll. This is roughly like folding up a small burrito. Place on a plate or cookie sheet with seam side down until you are ready too cook. Place a large non-stick pan over medium heat. Let the pan heat up for about 1 min. Add the rolls to the pan seam-side down. 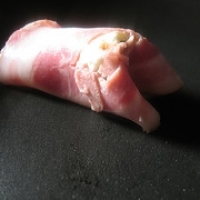 There is no need for oil because the pancetta will give off its own fat. Cook for about 2 min or until they are crisp. Using a pair of tongs to gently turn over. If they open up, don’t worry. Cook on the other side for another 2 minutes or until crisp. Once cooked, remove the pan from the heat. The trick is transferring them now to the crostini. 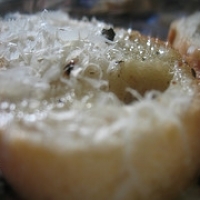 If the rolls didn’t open, you can simply use a spatula and place them seam-side down on the crostini. 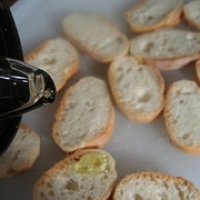 If they did open, an easy technique is to press the crostino (the singular form of crostini) against the top of the roll, and then roll them over using a spatula to apply upward pressure. Once completed, serve warm. Enjoy! It is the type of sandwich I love to eat. Thanks for sharing! OMG!!!! My mouth is watering already and it's only 9:30 in the morning. Thanks so much and yes, please keep him cooking. His (and your)recipes are awesome. Thanks for sharing. Thanks so much! Keep the praise coming... it only encourages my husband to cook more and come up with new recipes... thereby happily inflating his ego and my waistline! Yet again, so very awe inspiring myhusbandcooks! These recipes are top-shelf in every way. 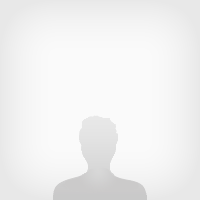 Like myhusbandcooks's recipes? Never miss an upload!